Electrophilic aromatic substitution (EAS) is the primary method used to add substituents to benzene. Aromatic molecules like benzene don’t react like regular alkenes, so catalysts or special conditions are required. The benzene won’t react like an alkene in a standard halogenation reaction; instead, a Lewis acid catalyst with the formula AlX3 or FeX3 must be used. The X in the reagents X2 and represents bromine or chlorine since the mechanisms are the same. The iron has an empty p-orbital, so one of the halogens bonds to it. This creates a good leaving group, so the benzene attacks the neutral halogen and the bond to the cationic halogen is broken. 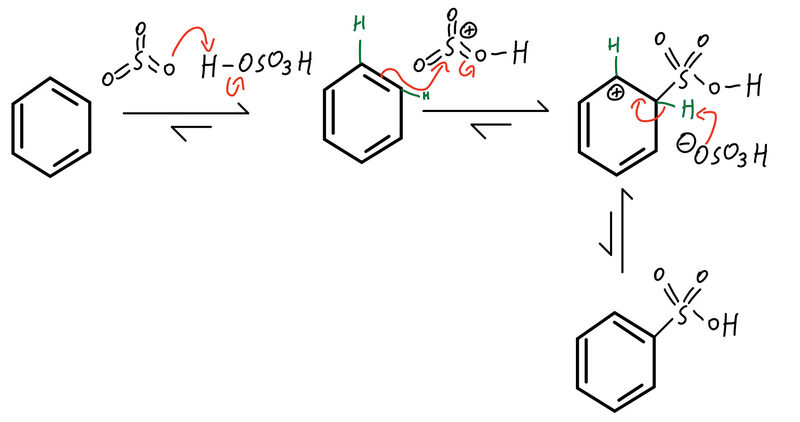 From there, the bond between the halogen and the iron breaks to pull off a hydrogen and restore aromaticity to the ring. So, you know, the generic name of this reaction is EAS halogenation. If we’re adding a chlorine, it’s EAS chlorination; if we’re adding a bromine, it’s EAS bromination. To get the benzene to react, we need to create an even stronger electrophile than the cationic nitrogen in nitric acid. To do that, we add a strong acid like H2SO4. The hydroxyl group on nitric acid deprotonates the sulfuric acid to become a good leaving group, and the anionic oxygen kicks it off as water to form a nitronium cation (NO2+). Now the benzene attacks the nitrogen, and the conjugate base of sulfuric acid restores aromaticity to the ring. Just like in nitration, benzene will not attack the central atom in SO3 without modification. To make the sulfur even more electrophilic, we use sulfuric acid to protonate one of the oxygens. Sometimes you might see it as just SO3 (fuming), and that decomposes to H2SO4. Now that the sulfur shares that positive charge with the oxygen, it’s electrophilic enough for the benzene to attack. Once the SO3H is attached, the conjugate base of sulfuric acid pulls off a hydrogen to restore aromaticity to the ring. Just like in the halogenation mechanism, a Lewis acid catalyst is needed. Chlorine or bromine can be used as the halogen in our alkyl halide. The halogen dissociates to form a complex with the Lewis acid catalyst, and a carbocation is produced. REMEMBER: carbocations are subject to rearrangement, so hydride shifts, methyl shifts, and ring expansions are possible. 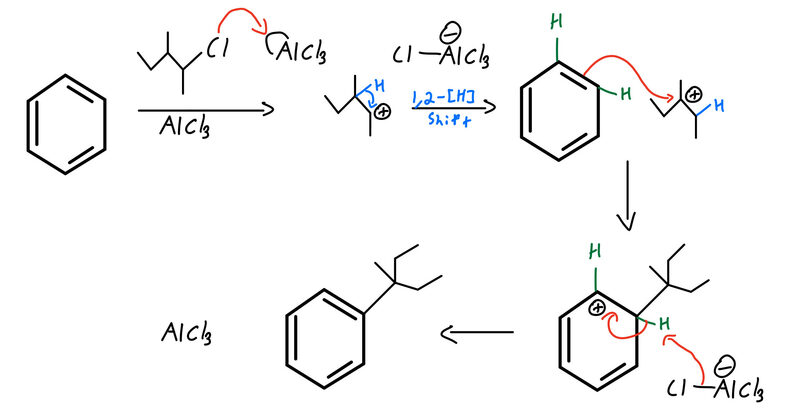 The benzene is then “tempted” enough to attack, and then it’s the same old story: the halide dissociates from its complex with the Lewis acid catalyst to remove a proton and restore aromaticity. This mechanism is very similar to Friedel-Crafts alkylation, but it uses an acyl halide (aka acid halide) instead of an alkyl halide. Again, chlorine or bromine can be used. 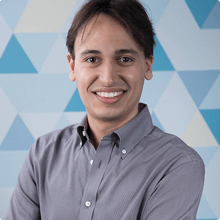 There are two variations to the first step, but each result in the exact same thing: the halogen bonds to the Lewis acid catalyst to form the blue molecule or it completely dissociates form the carbonyl to form the purple molecule. Acylium cations like the one in purple are resonance-stabilized by the oxygen and are incapable of rearrangement. The benzene then attacks the cation. If using the blue molecule, the benzene acts as a nucleophile in a nucleophilic acyl substitution mechanism, kicking off the Lewis acid catalyst-halogen complex. In both cases, the last step involves the halogen dissociating from the catalyst to remove a hydrogen and restore aromaticity. If there’s a carbocation, benzene can attack! A common version of this reaction is to use an alkene and hydrofluoric acid to form the carbocation. REMEMBER: carbocations are subject to rearrangement, so hydride shifts, methyl shifts, and ring expansions are possible. 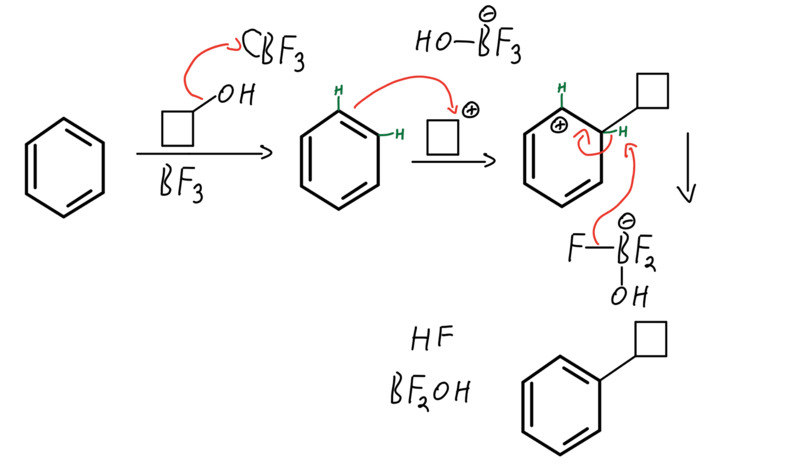 We usually use HF because F­– is a pretty poor nucleophile and preventing side reactions is a big plus. After any carbocation rearrangement, benzene will attack, and the fluoride anion will remove a proton and restore aromaticity. In the Lewis acid version of the “any carbocation” mechanism, an alcohol is used instead of an alkene. Boron’s empty p-orbital accepts the electrons from the dissociating alcohol’s bond to carbon, and a carbocation is produced. The benzene attacks the carbocation, and one of the fluorines dissociates from the Lewis acid catalyst-hydroxyl group complex to remove a hydrogen and restore aromaticity. This is considered an acid-promoted mechanism instead of an acid-catalyzed mechanism, since the BF3 lewis acid is consumed in the reaction (it becomes BF2OH). When there are two substituents on a benzene, we can denote their positions in a couple of ways: we can use numbers (e.g. 1,3 dichlorobenzene) or we can use the ortho, meta, and para designations (e.g. meta-dichlorobenzene or m-dichlorobenzene). Electron-withdrawing groups (EWGs) pull electron density out of the ring, reducing benzene’s reactivity. Electron-donating groups (EDGs) push electron density into the ring, increasing benzene’s reactivity. In EAS reactions with a substituent already on benzene, regioselectivity is something that needs to be considered! EWGs will generally direct the next substituent added through EAS to the meta position. EDGs will generally direct to the ortho or para positions (preferably para due to sterics). 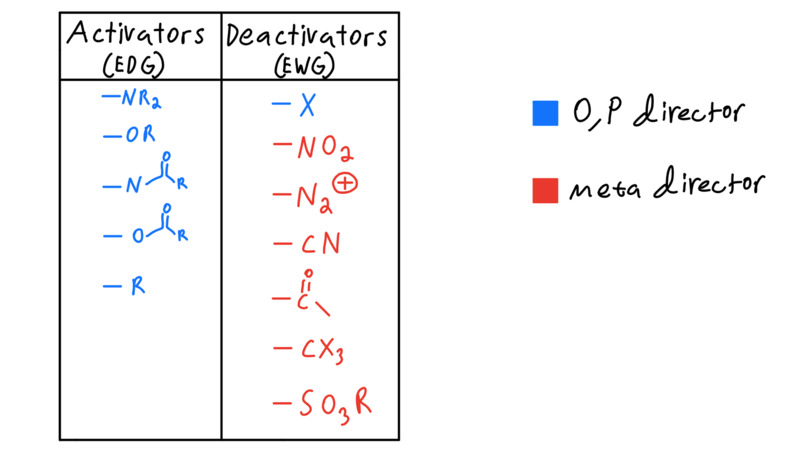 Notice that not all deactivators (EWGs) are meta directors! Halogens, denoted as X, are actually ortho, para directors. Which of the following is most likely to be the first step in the general mechanism for electrophilic substitution reactions?